Not much is certain about the life and career of the legendary Pelé. From his disputed birthdate to the number of total goals he scored over his career. Even his name has a question mark hanging over it. 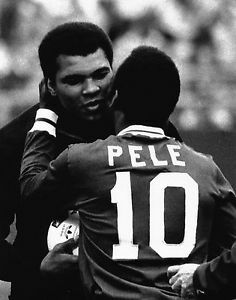 What can’t be disputed, however, is that Pelé is still regarded by most soccer fans worldwide as the single greatest player the game has ever seen. Pelé’s birth certificate states he was born on October 21st, 1940, and that his given name is Edison Arantes do Nascimento, Pelé has consistently maintained, however, that the certificate is inaccurate. He claims to have been born two days later, on the 23rd. Pelé was born and raised in Três Corações, in the southern part of Minas Gerais State, Brazil. This impoverished, largely agricultural area had few opportunities for young people, but football offered Pelé an escape route. He was so poor that he couldn’t afford a proper soccer ball and often made do with a sock stuffed with rags and tied with string. His youth career was spent at numerous clubs in the region and at the São Paulo State club Bauru. 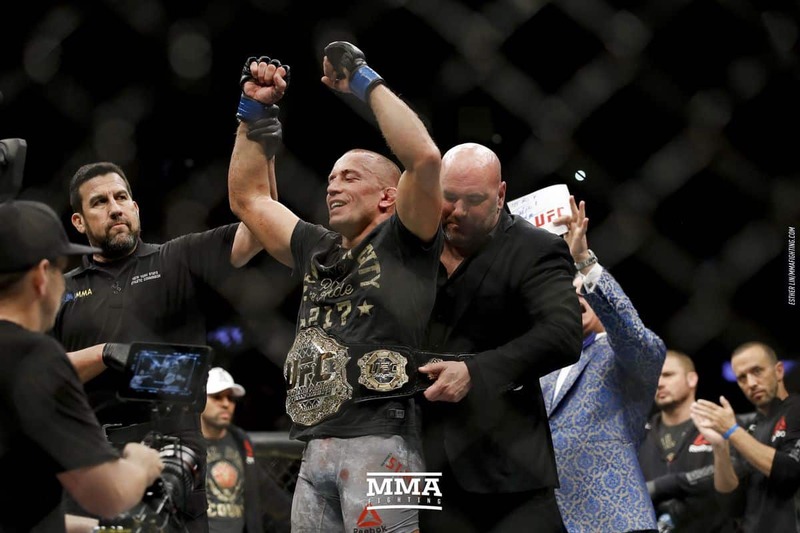 His father, Dondinho, had helped them win the Campeonato do Interior in 1946, one of the myriad of State Championships for which Brazil is renowned (or notorious). The phenomenal talent that he displayed from an early age soon brought Pelé to the attention of one of the Brazilian soccer legends of the previous generation, the great forward Waldemar de Brito. 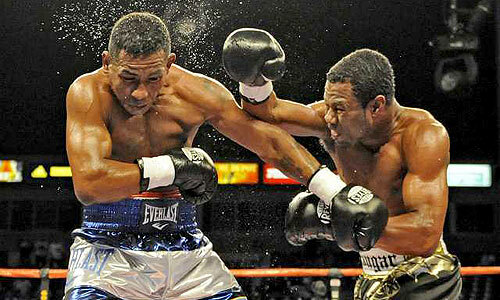 Waldemar took him to Santos, where he made his debut at age 16. Naturally, he found the back of the net in that match. In his first full season, still aged 16, he finished top scorer in the league. His close dribbling control, his athleticism, grace and agility soon made him a standout at the club. 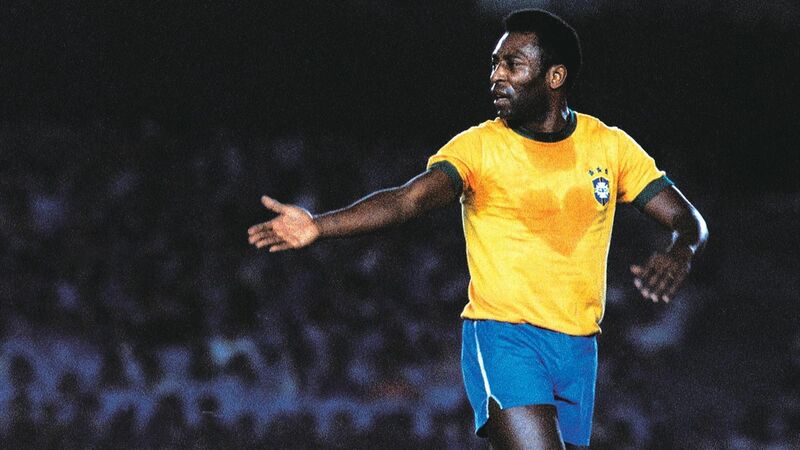 Add to this his screamingly powerful shot, his phenomenal areal ability and his sheer eye for the goal, and Pelé rapidly made it into the national team, earning his debut at 16 and becoming the youngest player ever to score an international goal. Pelé spent the best part of two decades at Santos, from 1956-74. It wasn’t for the lack of interest from the big money clubs in Europe, either. In fact, to keep him in Brazil, the President of the country declared Pelé a “national treasure” in 1961, which meant he was unable to leave the country for a foreign club. Santos took full advantage of Pelé’s brilliance, winning numerous domestic and international club competitions and touring the world to earn much-needed cash. Yet it is Pelé’s exploits on the international stage, especially at the World Cup, for which he is most renowned. As the BBC television documentary Gods of Brazil: Pelé and Garrincha so beautifully shows, Pelé’s impact on the Swedish World Cup of 1958 went far beyond the soccer pitch. 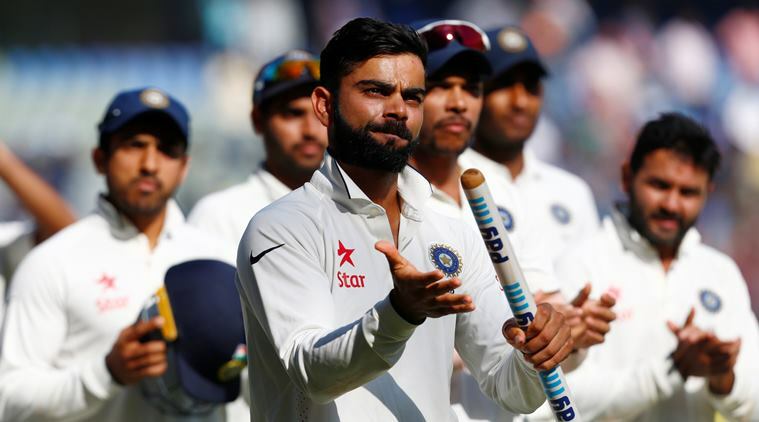 The handsome, ebullient youngster won the hearts of all those who saw him on and off the field. His exploit in helping Brazil win the tournament cemented his growing reputation, with the winner against Wales in the quarter-final being perhaps his most important contribution, despite his hat trick in the semi-final against France and his two goals against hosts Sweden in the Final. He was injured for most of the 1962 tournament and was mercilessly fouled during the 1966 World Cup, vowing never to play again. 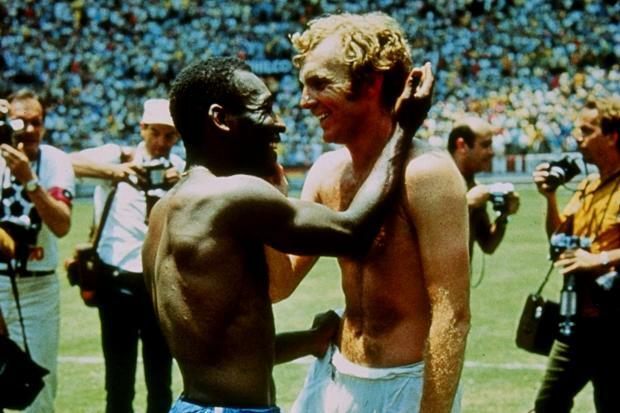 Pele of Brazil and Bobby Moore of England exchange shirts after the World Cup Group C game which Brazil won 1-0. He relented and helped lead his country to one of the most emphatic triumphs of its history, a 4-1 thrashing of Italy in the final. The 1970 World Cup winning team is universally regarded as one of the greatest sides ever to grace a soccer tournament. Pelé was a key part of making “the beautiful game” so beautiful. In total, Pelé scored 12 times in 14 World Cup appearances. He is one of only two players to have appeared in four Finals, and the only one to have earned three Winners’ Medals. 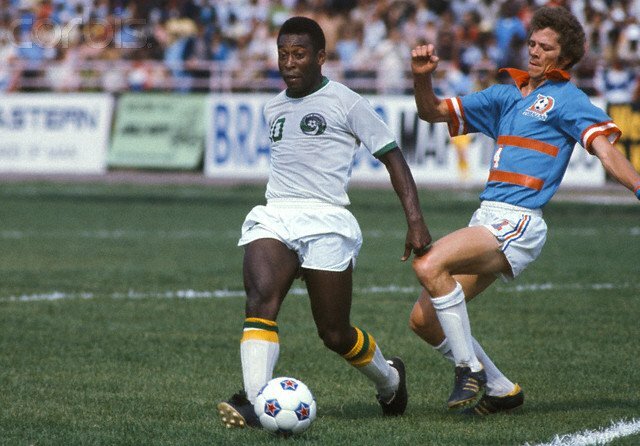 In 1975, Pelé joined the New York Cosmos of the NASL, for whom he played three seasons before retiring in 1977. His appearances did much to increase the public awareness of soccer in the US. His final exhibition game, which was for Cosmos against Santos, was memorable not only for Pelé’s final goal. But for the post-match celebrations with the superstar running around the pitch with US and Brazilian flags in either hand. Due to his appearing in many “unofficial” club and international games. Arriving at the true total of Pelé’s statistics is a bit daunting. Most experts agree, however, with the total of 541 goals in major competitions. In total, it’s estimated that he scored 1281 times in 1363 games. He’s also been a tireless worked as a global ambassador for soccer. He played a major role in bringing both the World Cup and the Olympic Games to Brazil in 2014 and 2016. Like George Best and almost every other player to be covered in this column, Pelé’s brilliance shone the brighter because he had a supporting cast of greatly talented players whose exploits deserve almost as much attention. It is the pure wizardry with the ball at his feet. The sheer brilliance of his control and deadly accuracy of his finishing. Though, that maintain Pelé’s status as the greatest player of all time, O Rei do Futebol, the King of Football. Pele was a phenomenal player.